This one’s really good! You have some real gems in your portfolio. Love it. Ok, I give, what is the point of an electric tennis ball? never mind Chryssta, where can I get one? …maybe re-wire the tennis ball for batteries…? It’s a rookie mistake, we all have to learn it at some point. Biff: *thinking* “why does my head start hurting every time I turn on the light? I think he meant a tennis ball machine, that shoots them out. *random thought time* what does biff sound like when he talks? *random comment time* (so what if i’m taking your idea, Frozen. welome to the world) Yay, biff’s kitchen is purple! I’ve been reading this all night, and this one probably made me laugh the hardest so far. I really love how odd this whole thing is. Great job, man. 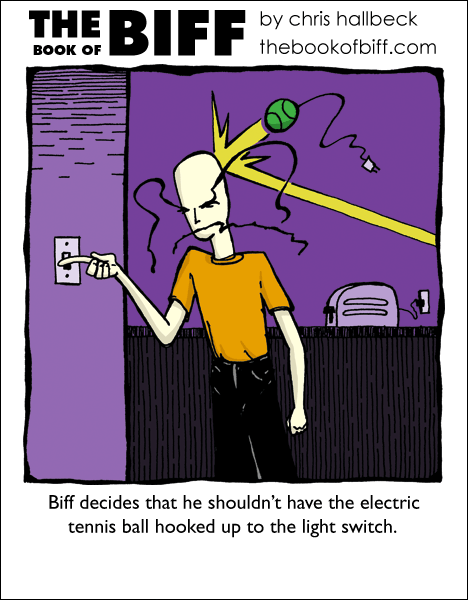 Funniest thing about this one is the electric cord coming out of the tennis ball. I will likely make one of these sometime. I’ve heard that if you fill a tennis ball with those strike-on-anything matches and throw it at a wall, it explodes. “darkpheonix”, how do you know its his kitchen? i mean, if an electric tennis ball can exist in Biff’s universe, cant he keep his toaster in a room other than his kitchen? Soo……what switch does he flick to get a toaster to the head? that’ll teach the kids who sneak into houses and flick switches!! HAH!! random: It got going before it came unplugged. I actually had friend that owned a battery powered tennis ball. It had an alarm clock built in it. When the alarm went off the only way to hit snooze was to bounce the ball off a wall. thats amazing barstow steve where can i get one? THAT’S why my head hurts! DragonPheonix, it could be purple, but red looks purple in the dark, so it could be red… We may never know, especially if he keeps his electric tennis ball plugged in. actually, this would make an awesome april fools day joke.